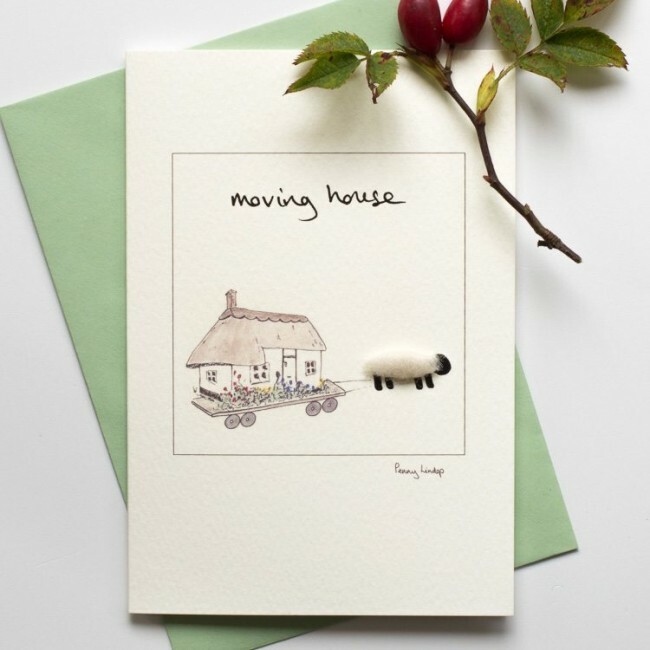 A beautiful handmade moving house card. This card features a fluffy white sheep bravely pulling a thatched cottage along to its new position! We hand finish the sheep with sheep's wool which makes the card a delight to feel as well as see! The card is blank inside for your own message. Supplied with a soft green envelope made from recycled paper. The card and envelope are supplied in a clear cellophane bag. Our cards look great mounted in a 4" x 6" photo frame. They make lovely little pictures and reminders for the recipient. Card size - 10.5 x 15 cm (4 x 6 inches) We print this card on a quality 280 gsm textured board.